Years ago, it was not uncommon to see a "one size fits all" product that was used for all crack repair jobs. With advancements in technology and better formulas created nowadays, crack repair resins can be in varying viscosities, allowing them to be used for different situations that were previously inaccessible. Hairline cracks were the most difficult to seal due to their incredibly thin nature, but for waterproofing contractors and homeowners that are with the times, it is no longer an issue. We will go through the various Flexomeric resins, their viscosities, and what uses they are best suited for. The FLEX-1050 is a low-range viscosity polyurethane, which is used to repair most common wall cracks that are 1/16" to 5/16" in width. Being low-range means it can be suited for a variety of applications, making it a versatile choice for contractors. It can also absorb ten times its weight in water, making it an excellent choice for most concrete crack repair. When situations are a little tighter, the FLEX-1150 shines. It is an ultra-low viscosity polyurethane, allowing it to permeate very fine cracks or joints easily. This resin has permitted contractors worldwide to start repairing hairline cracks that were previously unavailable to them with older technology. It remains the most reliable and popular choice for repairing hairline cracks today. For other wall situations where you're dealing with a more extensive crack, the FLEX-1100 will do the job. It is a mid-range viscosity polyurethane, allowing it to bridge gaps that are wider than 5/16". The higher viscosity facilitates the resin to fill the entire crack properly, and not drip out the bottom if a common product was used. If used properly, you will also need to use less resin to fill a wider crack than with a competing typical "one size fits all" product. For floor cracks, the situation is similar. 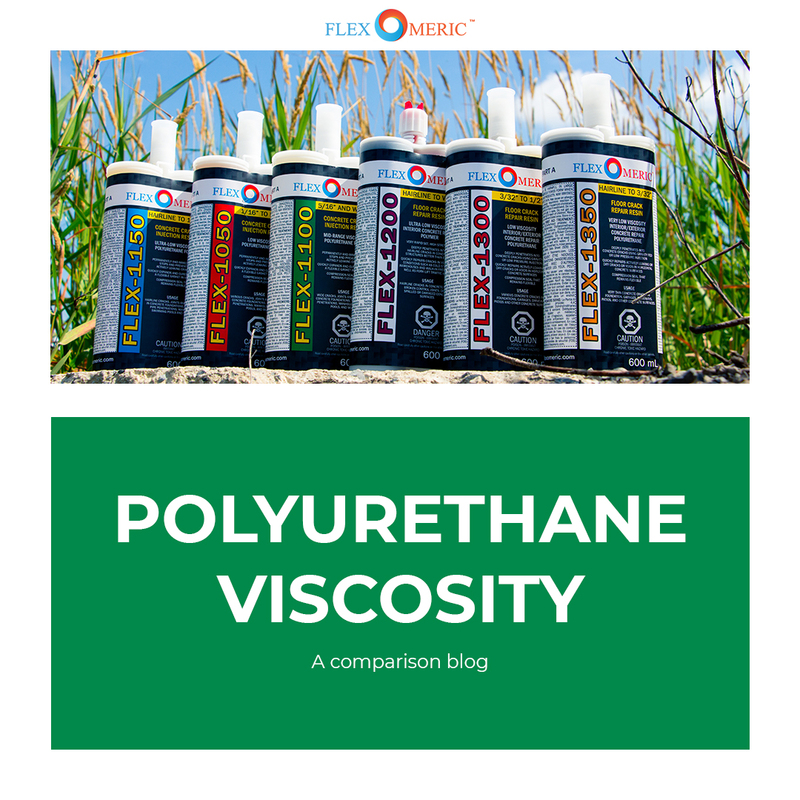 The FLEX-1200 is an ultra-low viscosity polymer with characteristics used for specific applications such as cold conditions, heavy traffic areas, limited "downtime," remains flexible, completely fills hairline voids, grade matching, and more. It is a unique product, as it can fill very hairline cracks, to very wide ones. It can even be used with silica sand to bridge very wide gaps. It also penetrates floor cracks better than epoxy and does not become brittle over time as epoxies do. The FLEX-1300 is a low viscosity polyurethane that can be gravity fed or injected into a crack and is designed for sealing dry and active water leaks in various cracks with high pH levels in the soil. This resin covers most typical floor cracks that are 3/32" to 1/2". The FLEX-1350 is a very low viscosity polyurethane, similar to the FLEX-1300, but for hairline floor cracks. This too is a new advancement in technology that allows contractors to fill cracks that were previously inaccessible to them. This now allows them to stop hairline cracks before they spall out of control with a clean and quick repair. If you're a waterproofing contractor (or want to add waterproofing to your business) and want to repair concrete cracks in interior or exterior applications such as foundation wall or floor cracks, around pipe penetrations, garages, driveways and concrete swimming pools, take a look at our contractor center to get our products and learn more about becoming a registered Flexomeric Contractor!